Kid, was the first gsp, my husband and I finished. We finished him on both the open and the am. side. He has produced several good pups. 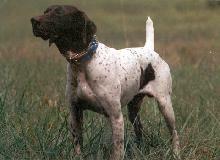 Kid is currently in Texas as top stud dog and used on guided hunts at Blue Mountain Preserve. We miss you Kid, but you are where you are happiest, in the field! We received word early this year (2007) that Kid has crossed the rainbow bridge. Thank you Kid for all the joy you gave us while you were here. May you never run out of birds to point. Goodbye our friend.